Warfare and long distance raids in colonial America generally ceased in late fall and resumed again in the spring, by both native and white inhabitants. Extreme temperatures, loss of concealing foliage and scarcity of game all contributed to this phenomenon, but the snow covered landscape which made tracking an enemy a relatively easy matter was the largest detriment to campaigns in enemy territory. An unexpected snowfall could be disastrous, so every effort was made at concealment of tracks. The most common method of trying to lose a pursuer was to enter one of the numerous streams or rivers ~ heading in one direction and then doubling back (sometimes walking backwards) until a favorable location to leave the water without leaving tracks could be found. This ploy could be repeated any number of times over short or long distances, depending upon how much time seemed available. Leggings and moccasins were removed if possible, because a warming fire was out of the question in enemy territory and you certainly didn’t want to continue on, for possibly days, with soaked and freezing footwear. 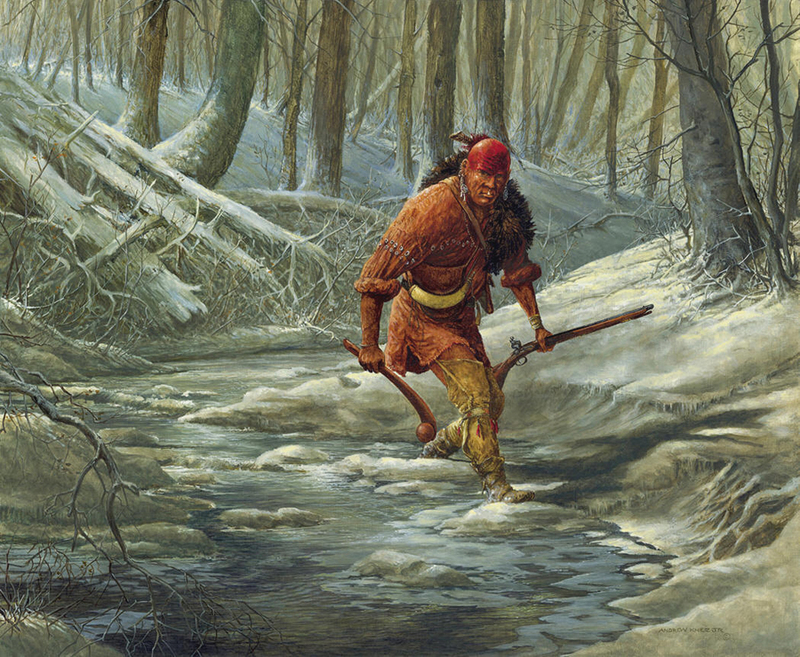 Because the warrior in this painting is hot on the trail of his quarry, he didn’t take time to remove his moccasins. As he passes a small point of land he sees a footprint in the snow ahead. Is this a true indication of the direction his enemy took, or is it a clever ploy to mislead him?